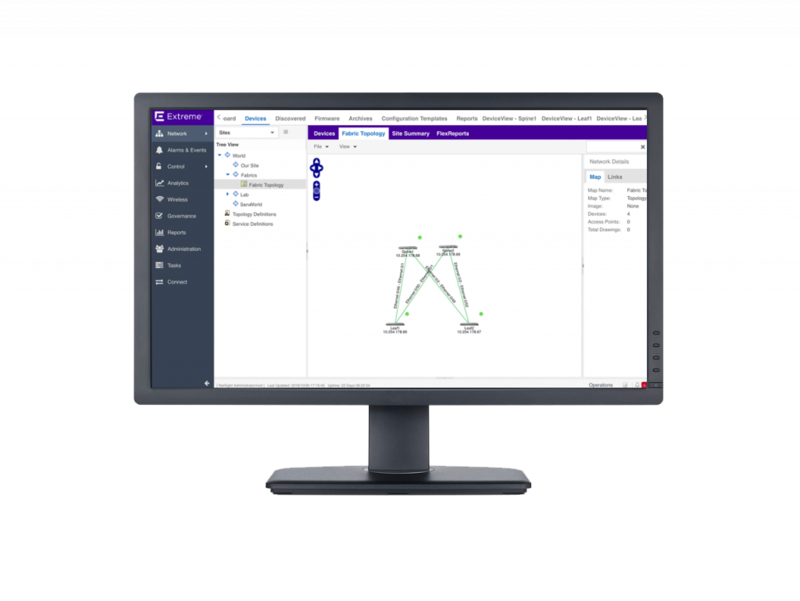 Earlier this month, Extreme Networks rolled out a whopping big announcement that included upgrades to its management, analytics, and automation software, as well as new hardware. On the software side, Extreme upgraded its management and monitoring software, Extreme Management Center, to encompass data center operations in addition to existing campus and edge management capabilities. The company is also extending its Extreme Analytics software to cover the data center, not just wireless and edge switches. Finally, Extreme is upgrading its Workflow Composer automation platform. One the hardware side, Extreme launched a new switch and a new router in its SLX family. Extreme Management Center, or XMC, is the company’s flagship monitoring and management platform. Originally built for Extreme’s campus and edge switching portfolio, it’s now been extended to the data center. Data center operators can use XMC for device management, including monitoring network devices, getting topology views, upgrading the OS, and so on. Operators can also use XMC for zero-touch provisioning of new switches. Using the XMC GUI, operators can add new switches to the data center fabric without having to run scripts or hit the CLI. Extreme says XMC can manage Extreme equipment as well as third-party gear. XMC hooks into third-party switches and network devices via APIs. “We aren’t trying to do vendor lock-in. We can give you a full Extreme solution, or mix and match with other vendors,” said Nabil Bukhari, Extreme’s Senior VP of Products. To help data center operators get more insight into how network conditions are affecting applications, the company has extended its Extreme Analytics software from its wireless and edge switching origins to cover the data center. Extreme Analytics gathers flow data, including sFlow and IPFIX, to provide insights not just into network conditions but the applications being supported. “You can see the applications in the network, the SLAs for the applications,” said Bukhari. By mapping application information to network analytics, data center operators can get a better understanding of which applications are being affected by problems or events. Extreme positions this analytics capability as a bridge between consuming raw flow data and investing in a full-blown application performance management solution. Extreme Analytics can sample sFlow or IPFIX, or get full-line-rate IPFIX depending on the ASIC in the hardware. Extreme’s SLX family of switches and routers comes from the acquisition of Brocade’s IP networking division (not to be confused with Extreme’s purchase of Avaya’s networking unit). The SLX 9030 is a 48-port ToR switch. Customers get a couple of options on port configurations. The first gives you 1 or 10GbE on all 48 ports. The second offers 4 uplink ports of 40 or 100GbE QSFP ports, plus 48 ports for server connections that can be 100MbE, or 1/10GbE. The SLX 9640 is a new 1RU router that Extreme positions for border routing or DCI. It supports 12 ports of 40 or 100Gbe, and up to 24 ports of 100MbE and 1/10GbE. The router supports up to 4 million v4 routes and 800,000 v6 routes. It has 6 Gbytes of packet buffers. The upgraded software is available now, and the new SLX switch and router are orderable.